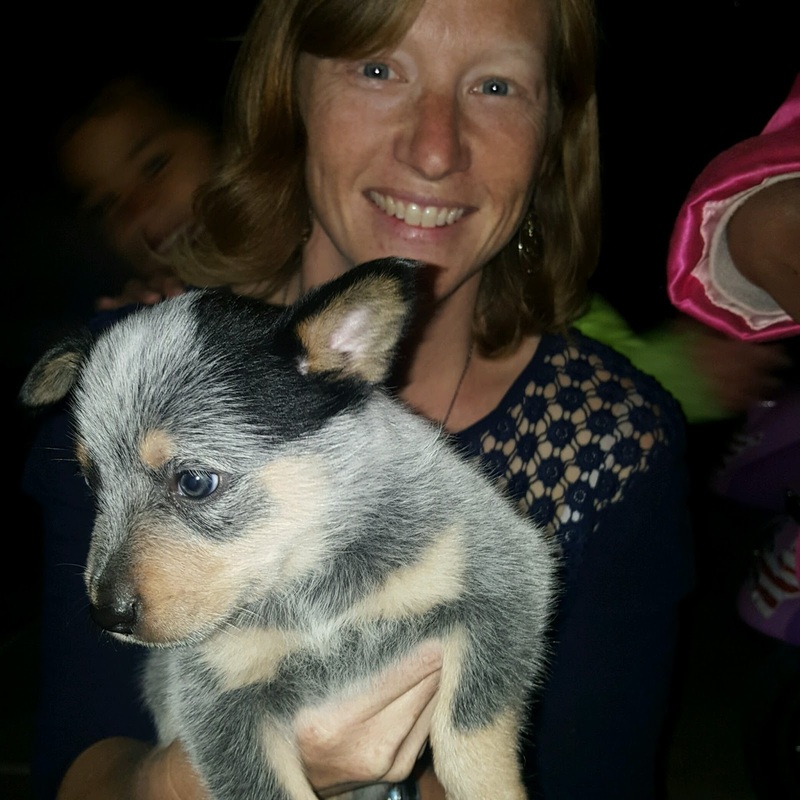 Yes, we're getting a puppy, a beautiful female blue heeler. 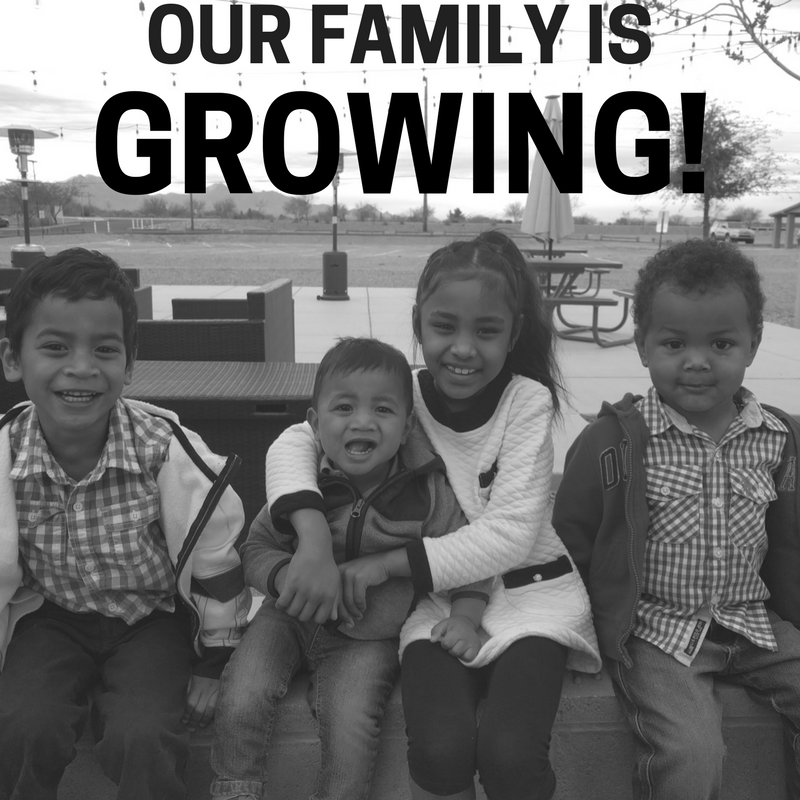 (Did you think we were having another baby? Fooled you! 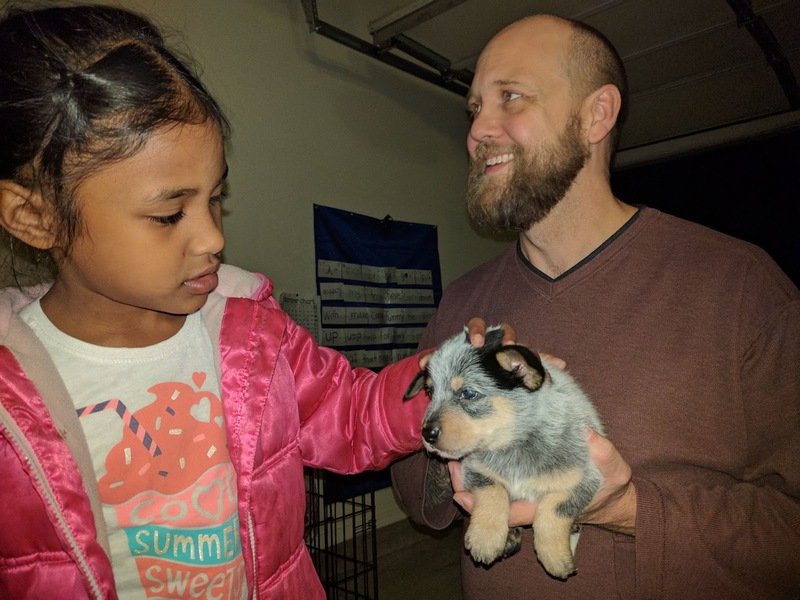 We've been thinking about getting a dog since before we moved back to America and were finally feeling settled in enough to start thinking about looking at dogs at the local animal shelter when a neighbor mentioned to me that she had blue heeler puppies that were ready to go to new homes. 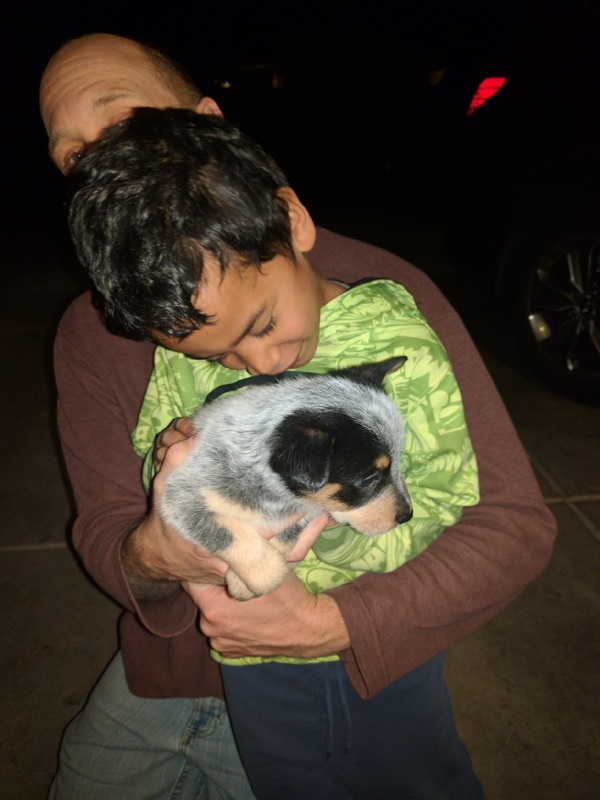 I had been pretty emphatically against getting a puppy- I know how much work they are and I just didn't want that- but D's always talked about getting a blue heeler. We talked about it for a few days and met the puppies two nights ago. Scout went right to D and was happy to sit in his hands and be petted. She did fine with the kids, even when Earth smacked her before I could stop him. We've put down the deposit and my neighbor will be keeping her for us until we get back from our trip to Mexico. I keep thinking back to the time we brought a kitten home right after we adopted Fire. That turned out to be very bad decision with no fore-thought put into it. We didn't have the time to train that cat properly and he turned into biter and had to be re-homed. 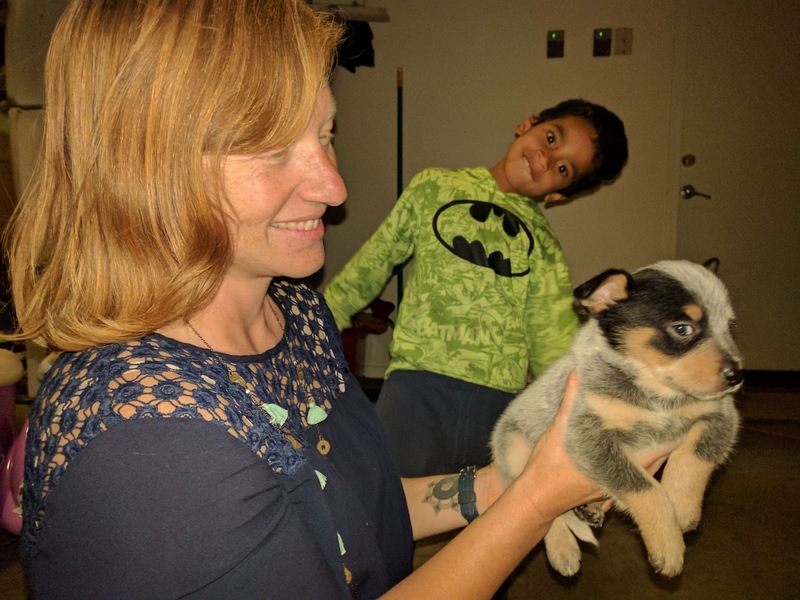 This feels like the complete opposite: we've talked a lot about getting a dog and the qualities we would be looking for if we got one and blue heelers as a breed meet all those. Since I'm home every day, I'll be able to spend time with Scout to train her. She can come on runs with me and between that and playing with the kids, we should be able to use up all that energy that blue heelers are known for. 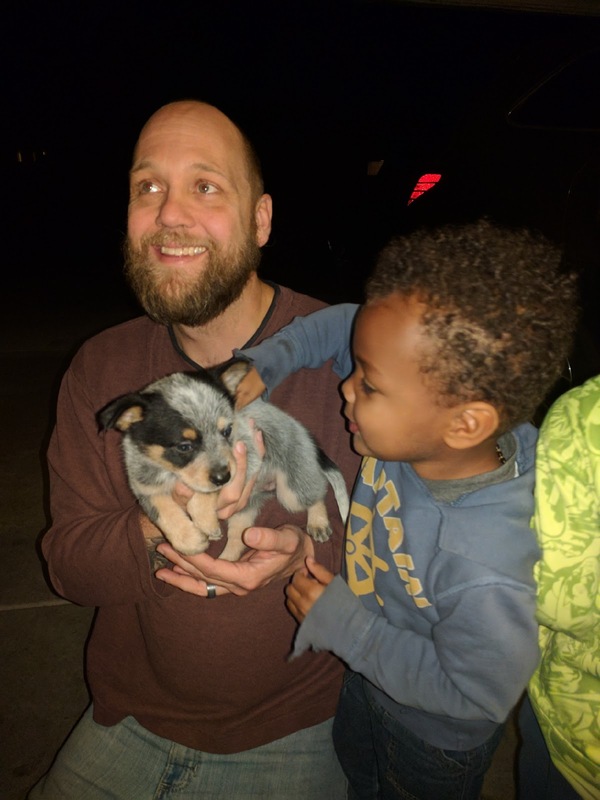 Have you had a puppy or a blue heeler? Any suggestions for us? Oh my, so adorable! If you want any advice (and by any, I mean all the available advice on the internet sifted and organized into digestible nuggets), call Josh. He's watched literally every dog companion training/care video that exists. A few things that worked best for us: Crate and spot training, Taste of the Wild dog food, Kong and other self-rewarding feeding techniques, positive reinforcement and redirecting, and teaching speak and quiet early on! Did you know that there are four different types of toys and different uses/purposes for them all? Josh does... Anyway, enjoy all the puppy cuddles, they grow so fast! And, give us a call if you want to pick our brains, puppy Watson is only 5 months so it's fresh. Ha! Got me, I thought 5???? Congratulations! Such a cute puppy! I agree with Stephanie, Crate, spot, kong, puppy food to start. Great pictures of each of you. she is beautiful! good look on the training. Love ya!